Election is a foundational doctrine. In the past, many of the ablest teachers were accustomed to commence their systematic theology with a presentation of the attributes of God, and then a contemplation of His eternal decrees; and it is our studied conviction, after perusing the writings of many of our moderns, that the method followed by their predecessors cannot be improved upon. God existed before man, and His eternal purpose long antedated His works in time. "Known unto God are all his works from the beginning of the world" (Acts 15:18). The divine councils went before creation. As a builder draws his plans before he begins to build, so the great Architect predestined everything before a single creature was called into existence. Nor has God kept this a secret locked in His own bosom; it has pleased Him to make known in His Word the everlasting counsels of His grace, His design in the same, and the grand end He has in view. When a building is in course of construction onlookers are often at a loss to perceive the reason for many of the details. As yet, they discern no order or design; everything appears to be in confusion. But if they could carefully scan the builder's "plan" and visualize the finished production, much that had puzzled would become clear to them. It is the same with the outworking of God's eternal purpose. Unless we are acquainted with His eternal decrees, history remains an insoluble enigma. God is not working at random: the gospel has been sent forth on no uncertain mission: the final outcome in the conflict between good and evil has not been left indeterminate; how many are to be saved or lost depends not on the will of the creature. Everything was infallibly determined and immutably fixed by God from the beginning, and all that happens in time is but the accomplishment of what was ordained in eternity. The grand truth of election, then, takes us back to the beginning of all things. It antedated the entrance of sin into the universe, the fall of man, the advent of Christ, and the proclamation of the gospel. A right understanding of it, especially in its relation to the everlasting covenant, is absolutely essential if we are to be preserved from fundamental error. If the foundation itself be faulty, then the building erected on it cannot be sound; and if we err in our conceptions of this basic truth, then just in proportion as we do so will our grasp of all other truth be inaccurate. God's dealings with Jew and Gentile, His object in sending His Son into this world, His design by the gospel, yes, the whole of His providential dealings, cannot be seen in their proper perspective until they are viewed in the light of His eternal election. This will become the more evident as we proceed. It is a difficult doctrine, and this in three respects. First, in the understanding of it. Unless we are privileged to sit under the ministry of some Spirit-taught servant of God, who presents the truth to us systematically, great pains and diligence are called for in the searching of the Scriptures, so that we may collect and tabulate their scattered statements on this subject. It has not pleased the Holy Spirit to give us one complete and orderly setting forth of the doctrine of election, but instead "here a little, there a little"—in typical history, in psalm and prophecy, in the great prayer of Christ (John 17), in the epistles of the apostles. Second, in the acceptance of it. This presents a much greater difficulty, for when the mind perceives what the Scriptures reveal thereon, the heart is loath to receive such an humbling and flesh-withering truth. How earnestly we need to pray for God to subdue our enmity against Him and our prejudice against His truth. Third, in the proclamation of it. No novice is competent to present this subject in its scriptural perspective and proportions. But notwithstanding, these difficulties should not discourage, still less deter us, from an honest and serious effort to understand and heartily receive all that God has been pleased to reveal thereon. Difficulties are designed to humble us, to exercise us, to make us feel our need of wisdom from on high. It is not easy to arrive at a clear and adequate grasp of any of the great doctrines of Holy Writ, and God never intended it should be so. Truth has to be "bought" (Proverbs 23:23): alas that so few are willing to pay the price—devote to the prayerful study of the Word the time wasted on newspapers or idle recreations. These difficulties are not insurmountable, for the Spirit has been given to God's people to guide them into all truth. Equally so for the minister of the Word: an humble waiting upon God, coupled with a diligent effort to be a workman that needs not to be ashamed, will in due time fit him to expound this truth to the glory of God and the blessing of his hearers. It is an important doctrine, as is evident from various considerations. Perhaps we can express most impressively the momentousness of this truth by pointing out that apart from eternal election there had never been any Jesus Christ, and therefore, no divine gospel; for if God had never chosen a people unto salvation, He had never sent His Son; and if He had sent no Savior, none had ever been saved. Thus, the gospel itself originated in this vital matter of election. "But we are bound to give thanks always to God for you, brethren beloved of the Lord, because God has from the beginning chosen you to salvation" (2 Thessalonians 2:13). And why are we "bound to give thanks"? Because election is the root of all blessings, the spring of every mercy that the soul receives. If election be taken away, everything is taken away, for those who have any spiritual blessing are they who have all spiritual blessings "according as he has chosen us in him before the foundation of the world" (Ephesians 1:3, 4). It was well said by Calvin, "We shall never be clearly convinced, as we ought to be, that our salvation flows from the fountain of God's free mercy, until we are acquainted with His eternal election, which illustrates the grace of God by this comparison; that He adopts not all promiscuously to the hope of salvation, but He gives to some what He refuses to others. Ignorance of this principle evidently detracts from the divine glory, and diminishes real humility —If, then, we need to be recalled to the origin of election, to prove that we obtain salvation from no other source than the mere good pleasure of God, then they who desire to extinguish this principle, do all they can to obscure what ought to be magnificently and loudly celebrated." 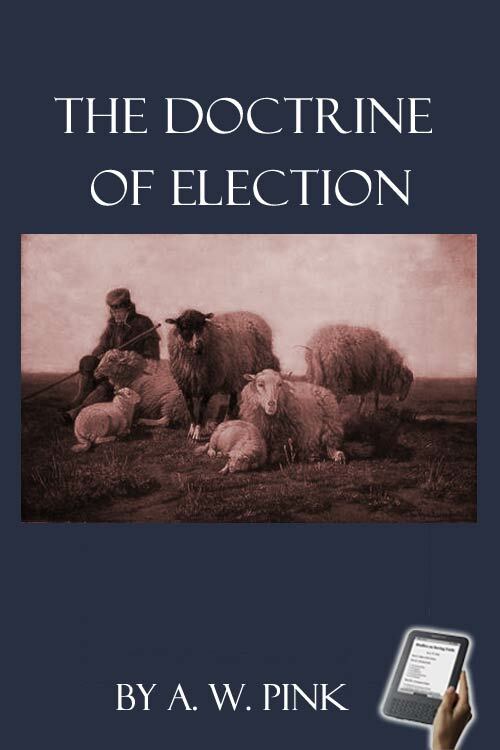 It is a blessed doctrine, for election is the spring of all blessings. This is made unmistakably clear by Ephesians 1:3, 4. First, the Holy Spirit declares that the saints have been blessed with all spiritual blessings in the heavenlies in Christ. Then He proceeds to show why and how they were so blessed: it is according as God has chosen us in Christ before the foundation of the world. Election in Christ, therefore, precedes being blessed with all spiritual blessings, for we are blessed with them only as being in Him, and we are only in Him as chosen in Him. We see, then, what a grand and glorious truth this is, for all our hopes and prospects belong to it. Election, though distinct and personal, is not, as is sometimes carelessly stated, a mere abstract choice of persons unto eternal salvation, irrespective of union with their Covenant-Head, but a choice of them in Christ. It therefore implies every other blessing, and all other blessings are given only through it and in accordance with it. Rightly understood there is nothing so calculated to impart comfort and courage, strength and security, as a heart-apprehension of this truth. To be assured that I am one of the high favorites of Heaven imparts the confidence that God most certainly will supply my every need and make all things work together for my good. The knowledge that God has predestined me unto eternal glory supplies an absolute guarantee that no efforts of Satan can possibly bring about my destruction, for if the great God be for me, who can be against me! It brings great peace to the preacher, for he now discovers that God has not sent him forth to draw a bow at a venture, but that His Word shall accomplish that which He pleases, and shall prosper whereto He sends it (Isaiah 55:11). And what encouragement it should afford the awakened sinner. As he learns that election is solely a matter of divine grace, hope is kindled in his heart: as he discovers, that election singled out some of the vilest of the vile to be the monuments of divine mercy, why should he despair! It is a distasteful doctrine. One had naturally thought that a truth so God-honoring, Christ-exalting, and so blessed, had been cordially espoused by all professing Christians who had had it clearly presented to them. In view of the fact that the terms "predestined," "elect," and "chosen," occur so frequently in the Word, one would surely conclude that all who claim to accept the Scriptures as divinely inspired would receive with implicit faith this grand truth, referring the act itself—as becomes sinful and ignorant creatures so to do—unto the sovereign good pleasure of God. But such is far, very far from being the actual case. No doctrine is so detested by proud human nature as this one, which make nothing of the creature and everything of the Creator; yes, at no other point is the enmity of the carnal mind so blatantly and hotly evident. We commenced our addresses in Australia by saying, "I am going to speak tonight on one of the most hated doctrines of the Bible, namely, that of God's sovereign election." Since then we have encircled this globe, and come into more or less close contact with thousands of people belonging to many denominations, and thousands more of professing Christians attached to none, and today the only change we would make in that statement is, that while the truth of eternal punishment is the one most objectionable to non-professors, that of God's sovereign election is the truth most loathed and reviled by the majority of those claiming to be believers. Let it be plainly announced that salvation originated not in the will of man, but in the will of God (see John 1:13; Romans 9:16), that were it not so none would or could be saved—for as the result of the fall man has lost all desire and will unto that which is good (John 5:40; Romans 3:11)—and that even the elect themselves have to be made willing (Psalm 110:3), and loud will be the cries of indignation raised against such teaching. It is at this point the issue is drawn. Merit-mongers will not allow the supremacy of the divine will and the impotency unto good of the human will, consequently they who are the most bitter in denouncing election by the sovereign pleasure of God, are the warmest in crying up the freewill of fallen man. In the decrees of the council of Trent—wherein the Papacy definitely defined her position on the leading points raised by the Reformers, and which Rome has never rescinded—occurs the following: "If any one should affirm that since the fall of Adam man's free will is lost, let him be accursed." It was for their faithful adherence to the truth of election, with all that it involves, that Bradford and hundreds of others were burned at the stake by the agents of the pope. Unspeakably sad is it to see so many professing Protestants agree with the mother of harlots in this fundamental error. But whatever aversion men may now have to this blessed truth, they will be compelled to hear it in the last day, hear it as the voice of final, unalterable, and eternal decision. When death and hades, the sea and dry land, shall give up the dead, then shall the Book of Life—the register in which was recorded from before the foundation of the world the whole election of grace—be opened in the presence of angels and demons, in the presence of the saved and of the lost, and that voice shall sound to the highest arches of Heaven, to the lowest depths of Hell, to the uttermost bound of the universe: "And whoever was not found written in the Book of Life was cast into the lake of fire" (Rev. 20:15). Thus, this truth which is hated by the non-elect above all others, is the one that shall ring in the ears of the lost as they enter their eternal doom! Ah, my reader, the reason why people do not receive and duly prize the truth of election, is because they do not feel their due need of it. that the "higher critics" and their blinded dupes should preach that which makes nothing of man; but even among those who wish to be looked up to as "orthodox" and "evangelical," there are scarcely any who give this grand truth a real place in either their pulpit ministrations or their writings. In some cases this is due to ignorance: not having been taught it in the seminary, and certainly not in the "Bible Institutes," they have never perceived its great importance and value. But in too many cases it is a desire to be popular with their hearers which muzzles their mouths. Nevertheless, neither ignorance, prejudice, nor enmity can do away with the doctrine itself, or lessen its vital momentousness. In bringing to a close these introductory remarks, let it be pointed out that this blessed doctrine needs to be handled reverently. It is not a subject to be reasoned about and speculated upon, but approached in a spirit of holy awe and devotion. It is to be handled soberly, "When you are in disputation, engaged upon a just quarrel to vindicate the truth of God from heresy and distortion, look into your heart, set a watch on your lips, beware of wild fire in your zeal" (E. Reynolds, 1648). Nevertheless, this truth is to be dealt with uncompromisingly, and plainly, irrespective of the fear or favor of man, confidently leaving all "results" in the hand of God. May it be graciously granted us to write in a manner pleasing to God, and you to receive whatever is from Himself.